Government Schemes are very important for UPSC Civil Services Exam – Prelims, Mains, and even the Interview. Did you ever feel learning the details of numerous government schemes, performance data, and economic trends – a tedious task? 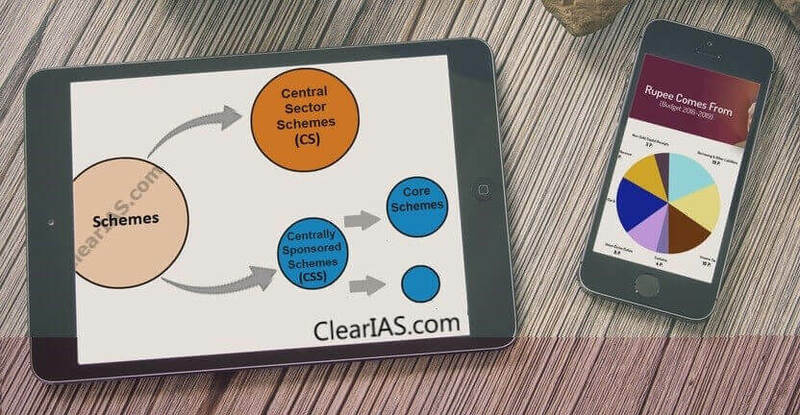 If yes, don’t worry; ClearIAS has come with a solution to quickly learn and revise the government schemes. A flash-card e-book (PDF) released! A flash card is a card which contains a small amount of information as an aid to learning. What if an ebook is created out of flash cards? Yes, we have compiled an e-book in PDF form “Government Schemes for Quick Revision” with data from various government websites. This book will help you to learn not only government schemes but also the main points of the latest union budget and economic survey! 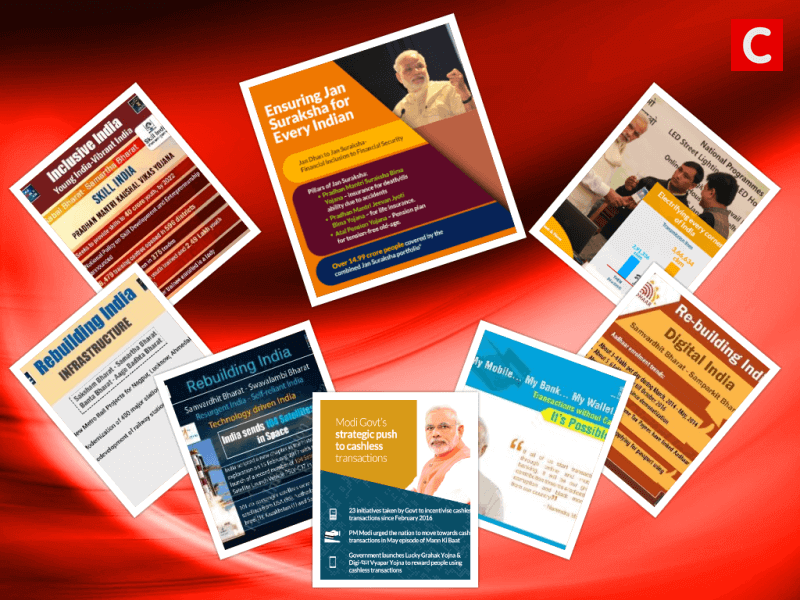 Click to download the e-book “Government Schemes for Quick Revision” in PDF form. The price of the e-book is Rs.99. What is the peculiarity of the book “Government Schemes for Quick Revision”? The unique feature of this book is that information is added in the form of pictorial slides, which makes reading easy. Pictorial illustrations are 10X faster than traditional learning! As you know, if data is presented in the form of graphs, pictures, and illustrations, that makes learning faster. As time is limited for every UPSC aspirant, we focus on helping you learn faster! Almost all details are collected and compiled from various government websites. Hence the data is authoritative. There are about 856 slides (pages) in the ebook, but as each slide has only the most essential data as in a flash card, this can be easily revised (say, in less than 3-4 hours). The book is really useful for both Prelims (you may expect at least 5-10 questions) and Mains (the data in this book can add a lot of value to your mains answers). Apart from learning schemes, the book will also help you to understand the governance aspects, the performance issues, union budget, economic survey, trends connected with GDP, CAD, FD, Tax/GDP ratio etc. We have added the list of the core of the core schemes, core schemes, and central sector schemes. The book also helps to cover important points from the latest Union Budget and Economic Survey. We compiled the details into an e-book format so that it would be easy for our readers for last-minute revision. We hope you all take the best out of it. All the best! Download Link: Click to buy the full version of the book “Government Schemes for Quick Revision” (PDF) from ClearIAS Store! Dear sir, who are already the part of clearias prelims test series 2018, they should be given this ebook pdf for free. Hi Salman, we shall surely take your feedback into consideration. All subscribers of ClearIAS Prelims Test Series 2018 will get the full version of the eBook (PDF) for FREE. Instructions for the getting subscriber discount are emailed to your registered email id. PS: If you have already bought the e-book, drop an email to contactus[at]cleariasexam.com with the subject-line “Subscriber-Discount on E-Book”. Mention your username of ClearIAS Prelims Test Series 2018. Once verifying the details of the payment, we will immediately issue the refund of the amount paid for the ebook “Government Schemes for Quick Revision” (PDF). All the best for exams! Sir I want to start UPSC preparation for 2020.Please help me. Appreciate your interest in Civil Services (IAS/IPS/IFS…). To get an early advantage you need be focussed and determined. compilation is good and keenly worked at. But there is no summary of the contents, its simply a copy paste of powerpoint slides. if i need to know which scheme lies where i have to scroll down and check every page. The construction is best suited as power point file not as a pdf book. Thank you for the positive feedback. Our revised 2nd edition now includes the list of all schemes in the beginning. We have also added more details of the schemes mentioned in the latest union budget and economic survey. All the best for the exam! Will there be a new edition coming for 2019 Prelims as Economic Survey and Budget will be updated for 2019? Is it relevant for UPSC 2019 ?